My experience with Certified Plans and Chamberlain Carpentry & Joinery. In May 2015, I decided to build a new house in Taupo. 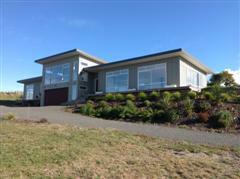 Having found a site with a good view of Lake Taupo - it was time to find a top notch builder. Having checked out plans from all the competitor building companies, I easily chose a plan “Totara” from the range of plans offered by Certified Builders. I really liked the artist’s impression of the house on the brochure – so asked Ian Chamberlain if we could “build that”. The plans were updated, the consents obtained – and work began on 1 July. I moved in in mid-November. The job was completed to the highest of standards, on time, and even better, on budget. A building experience cannot be much better than this, Ian and his team were fantastic to get along with – and the finished home is just perfect. I’m more than happy to recommend Chamberlain Carpentry & Joinery, and Certified Plans to anyone looking to build. I have to say that the level of professionalism shown by your staff has been extraordinary. I have had the pleasure of the company of Mark but more so Dave who has shown a sense of pride in what he is doing with a difficult old building..He has on every occasion been a pleasure to have working in our home and Mark and I have been impressed with his thoughtfulness, consideration, workmanship and tidiness. Ian Chamberlain is one of those rare professionals who does the job exactly as he said he would, in the time he would, for the price he would. He has built entire houses for my companies and done some simple alterations all with a cheerful smile. I would hire him and his team again and again.